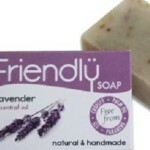 The team at Friendly Soap create beautiful, handmade soap. They use the traditional cold process method of natural handmade soap making which not only generates zero by-products but also allows them to carefully select every ingredient themselves. This process ensures that the soap they create is earth friendly, animal friendly and skin friendly too. We were lucky enough to trial both the lavender fragranced soap and the Peppermint and poppy seeds soap. Both lathered well, smelt divine and best of all didn’t irritate my sensitive skin or those of my two young children. The lavender soap is made with pure lavender essential oil and sprinkled with lavender blossom to gently exfoliate your skin. The peppermint and poppy seeds soap is certainly zingy and refreshing. It is made with pure peppermint essential oil and poppy seeds for an uplifting scrub. It’s a great pick me up if used with your morning shower. Other fragrances in the range include aloe vera, orange & grapefruit, tea tree and Lemongrass and hemp.